The sixth root in a successful Go to Market strategy is the focus of this article: Pricing Strategy. Kidding aside, pricing is rightly perceived as one of the more complex elements of a go to market strategy because there are so many two-way factors interacting, each influencing and being influenced – including, unfortunately, emotions and rationalization tendencies of a founder. Pricing is also a strong influencer defining a brand’s addressable market/consumer accessibility, as well as defining trade promotional campaigns, but at the end of the day, building a sustainable pricing model that drives profitability matters most, because without profits, there isn’t an ongoing concern. The fifth root in a successful Go to Market strategy is the focus of this article: Pathway (Commerce) Strategy. Imagine you’re selling your newly launched brand in a few dozen locations, and the Kroger or Target buyer expresses interest in placing your product in 250 locations. Should you do it? What if the Walmart buyer agrees to place your specialty product in line with the traditional CPG competitive set “to maximize shopper exposure”? Should you do it? If you’ve been selling your new brand on your own web site for the last 3 months, are you ready to start selling in brick & mortar retail? Most of the time the answer to these questions is “probably not”, but of course, the answer depends on many factors. Having a compass and benchmarks to help arrive at these decisions methodically, with focus and with discipline is vital. Hopefully I’ll shed some light on the many considerations when developing or refining your commerce strategy. The third root in a successful Go to Market strategy is the focus of this article: Production Strategy. Many service providers focus on sourcing suppliers for ingredients, packaging, and manufacturing/production, as well as oversight and advisory on the operational logistics associated with the aforementioned elements. It is highly likely an early stage brand will work with one or more of these fine partners and companies, and likely stay with them as they grow. While navigating each process there are dozens of questions to help providers define the product “spec” – specifications that guide them to conduct searches and manage processes to the founder’s expectations and arrive at the desired outcome. Defining your values and Purpose before entering these processes is critical to ensuring the end result is consistent with your original vision, or in the very least, provides a compass to guide you in the many decisions and changes you may need to adapt to along the way. For background on defining Purpose, see this article, the first in this series. This article focuses on the decisions made surrounding a product’s Production that create or impact its positioning. You could conduct or buy consumer research to identify the importance of these in your category, but let’s save the research time and money – choose to take a leadership position on ingredient quality and standards. Don’t accept the structure and inertia of the food processing system to dictate your options – set your standards and go after it. Not all ingredients are created equal and one of the most consequential decisions for ingredient supply is quality/integrity vs price. Often these are directly correlated (as price increases, quality increases). Different tests evaluate different factors to help determine the “quality” of an ingredient, and it’s important to conduct them or obtain certified results to verify. It’s also an implicit part of transparency. 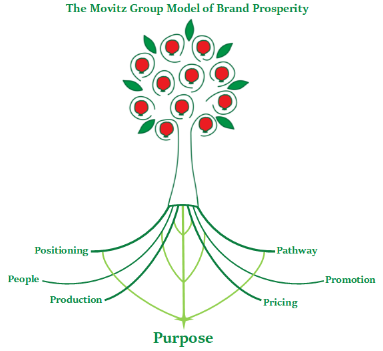 Core to a brand’s revenue growth is a disciplined and methodical Go to Market strategy. This is the second in an 8-week series outlining the framework elements of a successful Go to Market strategy. The first focused on Purpose and can be found here. The second core element to a successful Go to market strategy is the focus of this article: Product. When selling a product, the bottom line goal is to sell (1) The right product, in (2) The right place, at (3) The right price, at (4) The right time, to (5) The right consumer target. This article will focus on product, with a reference to place as merchandising. Place is typically considered the selling outlet or vehicle. This and the other components of this equation will be addressed in subsequent articles. "Everything that can be invented, has been invented"
If this were in fact the case, everything that was created in the last 119 years – and I mean everything – would not exist. Nor would our own dreams of what could be possible, or those of every generation to come, would ever be manifest into reality. Man, that’s a real bummer. Thankfully this isn’t the case, and in fact, it’s just the opposite. Our world is alive with new ideas, new breakthroughs, and new products every single day. If you’re a fan of food, beverage, personal care and wellness product discovery, there is no shortage of new products to delight, entice, intrigue, and engage with on a daily basis. Therein lies the conundrum – it’s never been easier to start a new brand, whether as a personal mission, opportunistic entrepreneur, or defensive strategy, yet the chances of success are small (it depends how one defines “success”, but let’s use a general notion of a sustainable business model with a meaningful level of target consumer awareness, category market share, household penetration, and profitability). I won’t cite statistics because that’s not the point to center on. This is: product strategy requires thoroughly defining multiple positioning points, but success is dependent on differentiating through the right ones. We're here with Mike Movitz. Mike, good to have you back on Cornucopia. Thank you, Matt. Good to be back. Let's talk about Campbell's, a company that made canned foods a staple in every American kitchen and currently a company that's undergoing a lot of transformation. Before we begin I'll just read a list of a few of the brands they own: Prego, Spaghetti O's, Pepperidge Farm, Bolthouse Farms, V8, Pace Salsa, Plum Organics baby food, and most recently the purchase of Pacific Foods, natural and organic soup maker. Mike, give us a little update on what Campbell's has been doing and why it's important in terms of this current shift in consumer focus away from more processed to less processed foods. I think to understand where Campbell's is headed, we need to understand the context of what's happening in general in the traditional food world. There is a seismic shift taking place on many fronts. For one, consumer eating habits have changed dramatically. When we think about the idea of three square meals a day, only five percent of consumers are actually eating three square meals a day. That is a thing of the past. Ninety percent of consumers today snack multiple times a day, and the lines between snacking and a meal is blurring. There's changes in demographics; changes in how people are interacting with and thinking about the importance of good food in their life; a consumer’s ideas about a company’s transparency, how they relate to that company, how authentic a company is, the values that company has and do they relate to the consumer’s values; Of course, there is e-commerce, digital and mobile technology disrupting retail and our shopping and buying habits; home delivered meals, meal kits, and prepared foods; and the shift from what we call center store of non-perishable products to the perimeter departments where the refrigerated and fresher food departments are. Whether that's dairy, produce, deli, meat, seafood, prepared foods, et cetera. All of these changes have been occurring at a at breakneck speed, much faster than companies were prepared for, nor was it really foreseen coming. The speed of change as well as the number of changes that are happening creates a very fluid and new dynamic that literally is rewriting the playbook for the path to consumer as we speak. Traditional CPG companies were built on a business model of scale for efficiency, and that really hindered their ability to adapt, respond, react and move with speed. We started to see a number of years ago the natural, organic and specialty products industry had been growing very well for a long time but suddenly it was becoming much more front and center, and it was where all the growth was. More than $20 billion dollars in market share has been lost by traditional CPG over the last five or so years and it's all moved to these smaller start up and natural organic specialty premium product companies. Michael Movitz was interviewed by Supermarket News about pricing outlook related to the Amazon/Whole Foods deal. ​The structure of the natural products industry could limit how much Amazon is actually able to reduce prices at Whole Foods, as many observers believe it will try to do once its pending $13.7 billion acquisition is finalized. While the price differential between natural/organic and mainstream products has been narrowing, and many retailers, including Whole Foods, have expanded lower-cost private label lines, the lifeblood of the industry remains many of the smaller producers that operate with high standards and production costs. The acquisition might provide Amazon with new insights about these cost structures, said Michael Movitz, founder and managing partner at The Movitz Group, a Lincolnshire, Ill.-based consulting firm. The breaking news this morning of Amazon’s acquisition of Whole Foods Market is as about exciting as it gets! This combination of businesses unleashes the power of new possibilities and potential from giant influencers Amazon & Whole Foods, a la Jeff Bezos and John Mackey. For grocery retailers, it adds even more pressure (read: opportunity) to a retailing environment already faced with the uncertainties of transition as ecommerce disrupts traditional retail models.